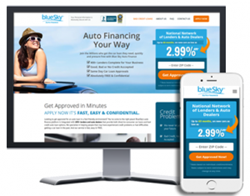 blueSky Auto Finance is offering more consumers than ever the opportunity to buy a car through their proprietary finance platform. For Participating blueSky Dealerships, this means more qualified auto sales leads are ready to buy cars. The demand from the subprime demographic for auto loans is robust across every advertising channel blueSky participates in. In Q1 and Q2 of this year, blueSky Auto Finance helped over 186,000 subprime car buyers to start the car buying process. Roughly 27%* of those car buyers who were matched with a finance partner through blueSky’s Special Finance program ended up securing the right loan for the right vehicle. There is greater opportunity to secure auto financing through blueSky’s lender platform. It expands blueSky’s network of participating dealerships and lenders, giving consumers more financing options. The acquisition of new finance partnerships along with record demand for subprime loans have favorably positioned blueSky for continued success throughout 2016 and beyond. Additionally, more special finance car sales are on the horizon in 2016 for Participating Dealers in blueSky’s Special Finance Leads program. Dealers, visit http://www.blueskymarketing.com or call 1-800-715-0975 to speak with a knowledgeable blueSky representative and find out how partnering with blueSky can help you generate incremental vehicle sales. Consumers looking for auto financing can visit http://www.blueskyautofinance.com to fill out an application. “There must be a better way for working people to get auto financing for the car they need.” This simple idea drove a group of long-time auto finance industry veterans to start BlueSky Auto Finance in 2004. We understand how confusing buying a car and securing a car loan can be, especially for customers in need of a bad credit auto loan. So we’ve put more than 100 years of combined automotive experience to work for you! Through our national network of direct and indirect lending partners, BlueSky gives customers the opportunity to get the best auto financing based upon their individual circumstances. blueSky Auto Finance is a subsidiary of blueSky Companies, Inc. Corporate offices are located in Northern California’s premier business park, Bishop Ranch in San Francisco’s East Bay. Data per May 2016 IHS Sales Match Research for blueSky Auto Finance.